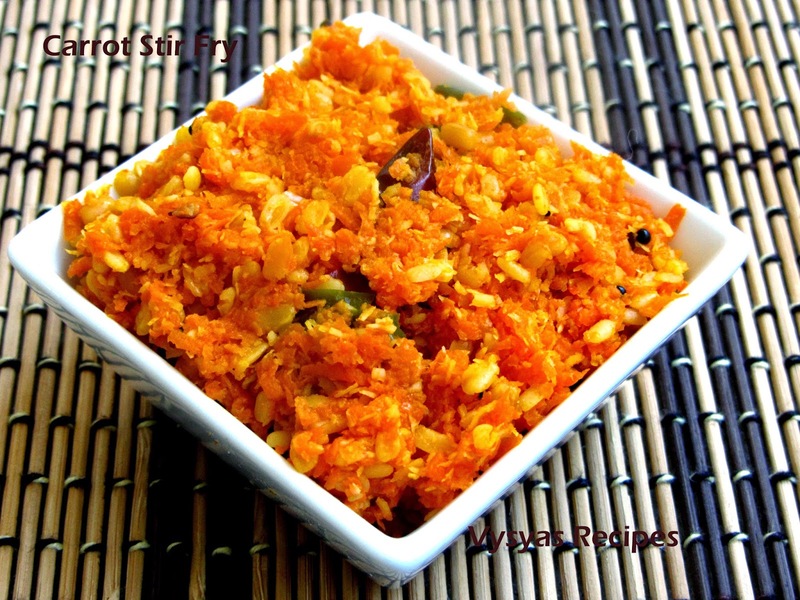 Carrot curry(Carrot Thoran) Goes well with rice, roti and chapathi. Any curries made with lentils is called pappu koora in Andra Pradesh. So it is called also called Carrot Pappu koora. The health benefits of carrot include reduced cholesterol, prevention from heart attacks, warding off certain cancers and many others. Most of the benefits of carrot can be attributed to its beta carotene and fiber content. This root, which has a scientific name of Daucus Carota, is a good source of antioxidant agents as well. Carrots are rich in vitamin A, Vitamin C, Vitamin K, and potassium.Both adults and children like carrots because of its crunchy texture and sweet taste.Now we prepare a crunchy carrot fry. Grated carrot - 1 cup. Moong dal - 2 tbsp. Grate the carrots and keep it aside. cook the moong dal in a vessel with little water, till it soft. Heat the oil, add mustard seeds,when it splutters add urad dal, curry leaves, red and green chillies. Then add cooked Moong dal, grated coconut and salt. cook for 2 more minutes till everything combines. Now stir fry is ready to serve.